Earth System Models (ESMs) are used for long term prediction, obtaining consistent global estimates of the various stores and fluxes of mass and energy, and evaluating risks relative to the fully coupled climate system, notably those caused by anthropogenic forcing. However, there is a very large degree of uncertainty related to the impact of climate change on the global water cycle based on such models (Intergovernmental Panel on Climate Change: IPCC, 2014). Therefore, there is a need for improved understanding and modeling of the global hydrological cycle. Currently, no model system exists which is able to produce reliable global estimates of discharge and lake water storage, mostly owing to a lack of data with sufficient spatial and temporal coverage. The SWOT mission will provide global measurements of water surface elevation at unparalleled spatial resolutions. The main objective of this study is to develop methodologies for using SWOT data to improve the input parameters and the physics of the hydrological and hydrodynamic parameterizations in ESMs at the global scale, including rivers, lakes and ground water reservoirs, leading to improved estimates of the corresponding reservoirs and exchanges between them. This is a very active area of research in the international community since there is a need to better understand the potential impact of climate change on the world’s water resources in order to develop adequate mitigation and adaptation strategies. This study contributes to certain key SWOT scientific priorities; i) improved understanding and modeling of lake processes, ii) integration of SWOT measurements into models, and iii) the development of river discharge estimate product. The anticipated outcome: a better understanding of the potential impact of climate change on the world’s water resources and feed-backs with the climate system. Finally, the ultimate goal of this study directly addresses the goal stated in the NRA which is to "characterize the spatial and temporal variations in surface waters globally". There are two parallel actions in this study which mutually benefit from technical and methodological developments thereby contributing to the development of a consistent approach to optimally use SWOT measurements within the continental hydrological component of ESMs. The first action centers around using SWOT measurements to obtain improved river storage and discharge estimates on the global scale using a hydrological model adapted for global climate models. The method determines optimal spatially distributed parameters which are difficult to measure or unknown, such as the Manning coefficient. Several studies have been done which have examined different data assimilation methodologies and model parameter sensitivities (e.g. using the ANOVA technique: Emery et al. 2016). This study is particularly useful for better understanding the model responses to a range of parameter values. This was done to prepare a robust ensemble of perturbed simulations for use with the Ensemble Kalman filter. In parallel, another goal of this study is to continue to improve the assimilation methods by including more realistic observation errors, including other model error uncertainties. In terms of estimating actual SWOT measurements, identical twin data assimilation experiments have been done (Pedinotti et al., 2014; Haefliger et al., 2017). While being very useful for development of the data assimilation scheme, such an approach is obviously quite simple compared to using actual SWOT measurements. More recent work progressed towards ingesting actual SWOT data by using river heights simulated by a combination of satellite data and an independent river routing model (Emery et al., 2017). The second theme focuses on improving lake storage and extent estimates within global climate models using SWOT measurements. Currently, lakes are generally represented in such models using one-dimensional approaches without considering the lake storage change: the main purpose of such schemes being to supply the atmosphere with reasonable estimates of heat and mass fluxes (but in this context, lakes represent infinite mass source or sink terms). In order to fully couple all of the components of the continental hydrological cycle (rivers, lakes; groundwater, etc..), consideration of the lake and reservoir mass (or volume) changes is needed. SWOT will provide information on lake extent and height variations at the global scale at a high spatial resolution, thus enabling a leap forward in this regard. The first step is to develop a storage reservoir in the FLake model, which is used in many operational Numerical Weather Prediction (NWP) centers throughout the world. This work will begin in Autumn 2017 as a part of a PhD thesis, and it will involve collaboration with several French and international partners. Comparison with a detailed hydrodynamic model is also planned. Figure 1. The ISBA-CTRIP system for a given grid cell. ISBA surface runoff flows into the river/surface reservoir, ISBA gravitational drainage feeds groundwater reservoir, G. The surface water is transferred from one cell to another following the TRIP river routing network. This study uses the surface-hydrological model ISBA-CTRIP (Interactions between the Surface Biosphere Atmosphere-Total Runoff Integrating Pathways) of the SURFEX platform (EXternalized Surface: Masson et al., 2013) developed at the CNRM (National Center for Meteorological Research). This model is used to model surface hydrological processes in the global climate model ARPEGE of Météo-France. The ISBA model (Noilhan and Mahfouf, 1996) is a state-of-the-art Land Surface Model (LSM), and for the current study it is spatially distributed over a regular grid. The CTRIP river routing model (RRM: Decharme et al., 2013) is based on a mass and energy balance: it simulates the lateral extension of flooded areas and the lateral transfer of water from one cell to another through a river network (Oki and Sud, 1998). 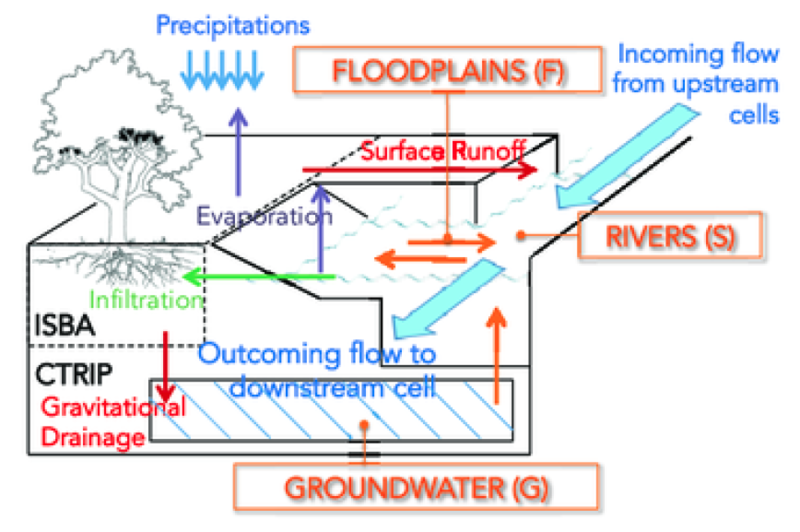 It consists in a system of three reservoirs (see Figure 1): the river, the groundwater and the floodplain. Inputs from ISBA to CTRIP consist in surface runoff, drainage, and evaporation from floodplains is a potential sink. For this study, it uses the same grid resolution (currently 0.5° x 0.5°) as ISBA. 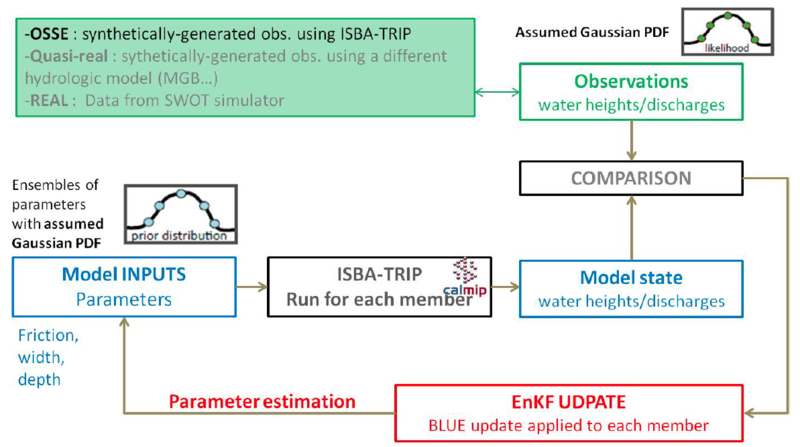 The methodology used herein for assimilating virtual SWOT-like data into a large scale hydrological model (here ISBA-CTRIP) was first presented by Pedinotti et al. (2014). Since that time, the methodology has been further developed and evaluated by Haefliger et al. (2017) at the mesoscale and Emery et al. (2016, 2017) at the large (regional) scale. A schematic is shown in Figure 3. The main questions addressed in this ongoing study are; I) how can distributed water elevations help to better constrain the water budget estimates at regional to global scales? ii) what are the best methodologies to assimilate (optimization, EKF, EnKF, particle filter are among those tested) virtual SWOT data to correct parameters (Manning, depth) and model outputs (elevation) for large scale model applications? iii) what are the best ways to treat scale differences between SWOT data and the hydrological model? A high-resolution SWOT simulator, under development at NASA- JPL and CNES, will be used with simplifying assumptions in order to obtain reasonable first order estimates of instrument and other types of errors, but layover errors will not be possible at this coarse resolution. Figure 2. 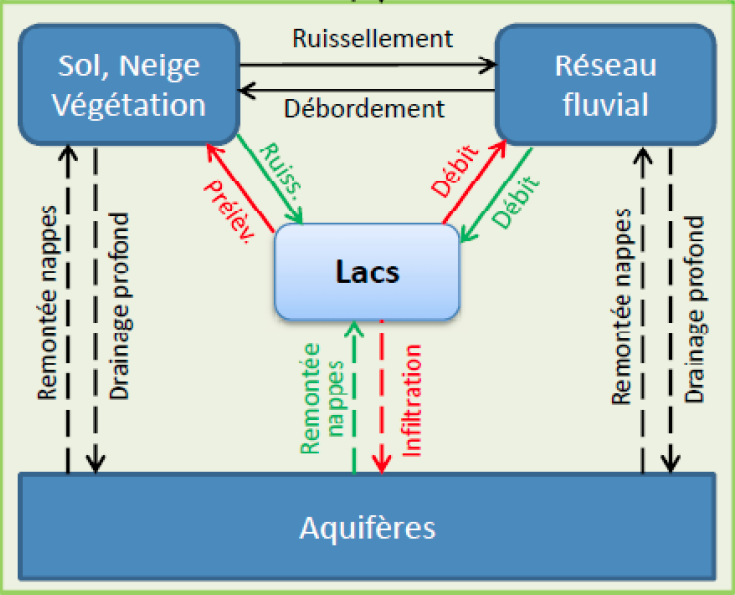 A schematic illustrating the different mass exchanges between lakes and rivers, the adjoining land surface (including the vadose zone), and ground water (D. Léroux). In some areas of the world the density of lakes is very high, making it one of the major players playing on the interactions between the surface of the globe and the atmosphere. The temperature of the lakes is influenced in the short term by meteorological forcing and in the longer term by the seasonal variations of the water level of the lakes, that is to say by their water balance. The lake model FLake (Mironov, 2008; Le Moigne et al. 2013) developed and used at CNRM has been designed to be coupled with an atmospheric model. The model represents the basic thermodynamics and turbulent mixing processes within a water medium. Although the model is well suited for meteorological applications, it needs to be improved for hydrological purposes. Indeed, the current version of the model does not account for a water balance and therefore its use is limited to the computation of the surface energy balance (and the resulting surface fluxes) only. The main improvement is the implementation of a water mass budget in the lake model, which consists in adding a reservoir to the FLake model in order to explicitly compute the lake volume. The focus will be on volume variations rather than absolute values. This will permit the utilization of the lake storage variation estimated from high resolution SWOT data (in terms of height and surface variations). At the regional scale, the water storage can be computed as the contribution of several components: precipitation that directly feeds the lake, evaporation due to wind and a humidity deficit above the lake surface, inflow and outflow from connected rivers, basin surface runoff and irrigation (see Figure 2) . The comparison between both simulated and SWOT storage variation will be used to explain some of the uncertainties related to the inflow and outflow, or irrigation for dry periods. As soon as the new model development is ready, an inter-comparison is planned which will compare hydrological components like storage variation or evaporation over lakes. Finally, the representation of water-bodies in our current NWP or climate models rely on a global classification ECOCLIMAP at 1km horizontal resolution (Faroux et al., 2013). An undergoing work is starting to build a new classification of all surfaces based on ESA-CCI products at a 300m resolution. In this study, we will assess the impact of using high resolution information on the water storage change. This work will prepare the model for integration of the future high resolution SWOT data into the model physiographic input data base. Figure 3. A schematic of the data assimilation methodology which has been used so far in this study with newer (this past year) and prospective features/tests represented by gray text in the green-filled box. Figure 4. Study area from Emery et al. (2017). The pixels which contain both a gauging station and a river height virtual station are indicated using red-numbered circles. Data at these stations were assimilated into the ISBA-CTRIP model. A recent development now permits either an estimation of model parameters (such as the Manning coefficient) or the estimation of a state variable (such as river storage). An example of using SWOT to improve large scale hydrological state and flux estimations is given herein. 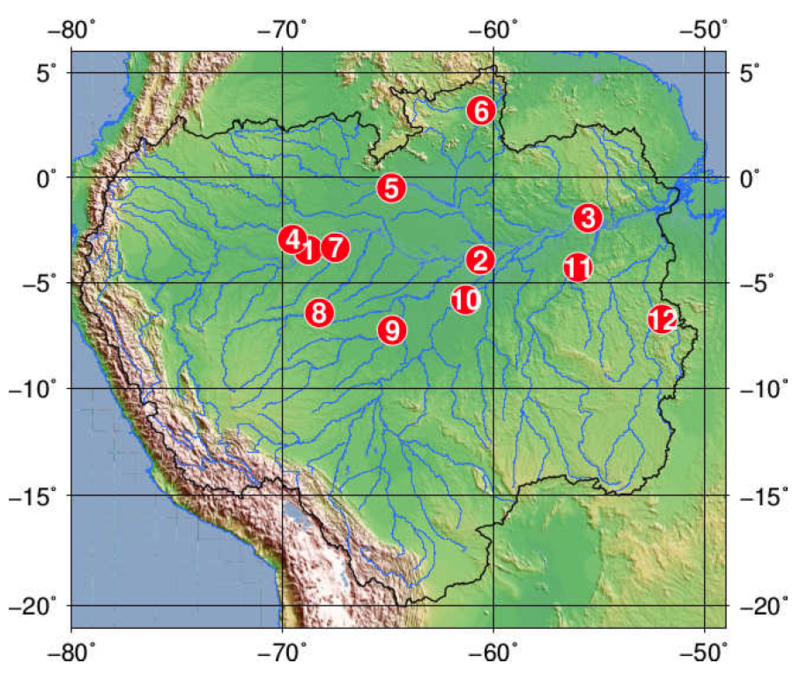 This study has been conducted over the Amazon river basin (see Figure 4). It is the world’s largest river in terms of averaged discharge (2x105 m3 s-1) and drainage area (6.15x106 km2). The discharge at its mouth represents 30% of total freshwater inflow to the Atlantic Ocean and its catchment area covers about 40% of South America. The river source is located in the Peruvian Andes and it flows through the Brazilian rain forest while receiving water from several main tributaries. This study uses a corrupted model ensemble and assimilation strategy. The DA technique is a sequential Ensemble Kalman Filter (EnKF, Evensen, 2003). The control variables consist in the prognostic or diagnostic variables of the ISBA-CTRIP model. Prognostic variables are the physical unknowns in the differential equation system that describe the model behavior. The diagnostic variables are also physical variables but are estimated from the prognostic variables. Unlike hydrodynamic models, which directly solve the Saint-Venant equations and where the discharge is a model state variable, the hydrological model ISBA-CTRIP solves differential equations describing the time evolution of water storage in the river, the groundwater and the floodplain. Then, the water elevation and river discharge are diagnostic variables derived from the prognostic variables. The water levels at so-called "virtual stations" (VS) have been transformed into altimeter-based discharge (Paris et al., 2016) using the rating curves constructed from a combination of ENVISAT water levels and discharge estimates from the MGB-IPH hydrological model which was calibrated using observed discharge from 145 in-situ stations. The VS have been built where the altimeter track crossed the river stream. For the state estimation, Emery et al. (2017) performed DA to correct the initial water storage (model initial condition) by assimilating this altimeter-based discharge into ISBA-CTRIP. These state estimation experiments permitted a departure from the idealized framework of twin experiments by assimilating so-called "real data". It also lead to an estimation of the contribution of incorporating flow data from satellite measurements. The results (Figure 5) show that the errors on the flow rate are generally improved: the free run gives an RMSE of 2.76 x 103 m3 s-1 (73.6%) compared to the in-situ data, while the corrected run has an RMSE of 1.98 x 103 m3 s-1 (53.9%). Figure 5. Comparison between the open-loop ISBA-CTRIP simulation (i.e. without data assimilation: blue curve), the observed discharge (black dots), discharge estimated from rating curves and water heights from ENVISAT (green diamonds) and ISBA-CTRIP discharge after assimilation of the ENVISAT-based data (red curve) for several locations indicated in Fig. 4 (Emery et al., 2017). The main anticipated results are; i) We anticipate to make significant improvements and advances in the area of integration of SWOT measurements into large scale hydrological and lake models. Indeed, coarse resolution models have specific issues related to scale and to the simplified representation of hydrological and hydro-dynamical processes. Therefore, we are building upon experience gained during previous studies we have engaged in within this project to develop more elaborate and robust data assimilation techniques along with optimal use of the simulator (along with other independent synthetic estimates of SWOT measurements through multiple collaborations within TOSCA and ROSES), which are increasingly more adapted towards using SWOT measurements in large scale models. ii) The previous item will lead to improved discharge estimates, which then overlap with several other TOSCA and ROSES propositions concerning the development of discharge algorithms. iii) In terms of lake processes, we are working on adapting a commonly used lake model (used in operational numerical weather prediction) into a model with a dynamic reservoir which will be more amenable to utilizing SWOT measurements in terms of constraining the lake surface area and optimally incorporating height changes to both improve the lake mass and to estimate other fluxes, such as inflow. Over the longer term of the project, this will also permit the coupling of rivers and lakes (via an exchange of mass). The newly modified model will then be available to the numerical weather prediction community (as FLake is shared within a large consortium of NWP and ESM models), which could help propagate the use of SWOT data in the hydrometeorological community. iv) Finally, owing to the global scale approach, we will provide a characterization of surface waters in terms of both rivers and lakes/reservoirs, in addition to being able to quantify their interactions with other components of the continental hydrological cycle using an integrated modeling approach (ground water, runoff, irrigation...). The over-arching result will be a more realistic representation of the global water cycle in ESMs thereby opening the door to improved estimates of water resources in both seasonal prediction and climate change scenario work. 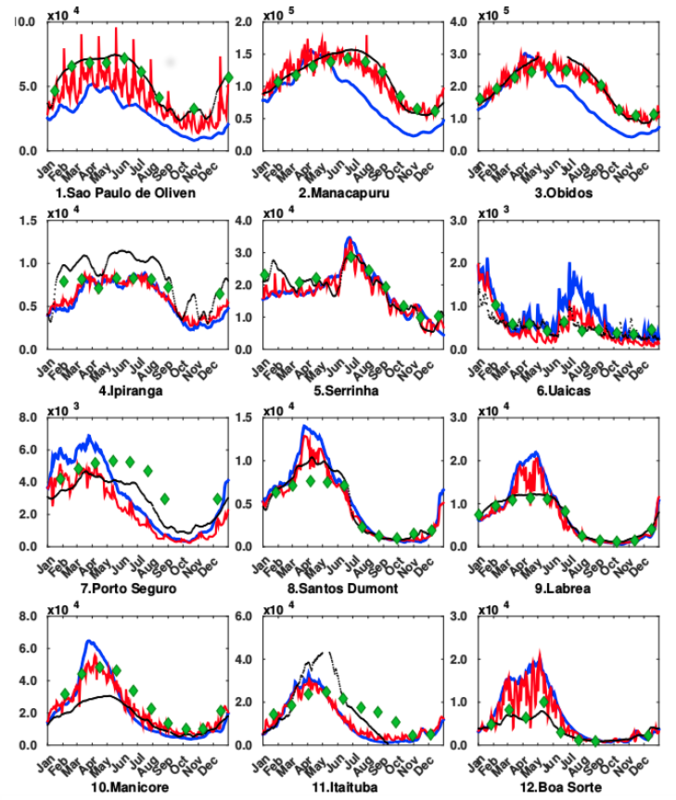 The data assimilation techniques should be applicable to large scale river routing models which have been developed in recent years at CNRM Météo-France and elsewhere. Decharme, B., R. Alkama, F. Papa, S. Faroux, H. Douville, and C. Prigent, 2012: Global off-line evaluation of the ISBA-TRIP flood model, Clim. Dyn., 38(7-8), 1389–1412, doi:10.1007/s00382- 011-1054-9. Evensen, G., 2003: The ensemble Kalman filter: theoretical formulation and practical implementation. Ocean Dynamics, 53, 343–367. Faroux, S., A. Kaptue Tchuente, J.-L. Roujean, V. Masson, E. Martin, and P. Le Moigne, 2013: ECOCLIMAP-II/Europe: a twofold database of ecosystems and surface parameters at 1 km resolution based on satellite information for use in land surface, meteorological and climate models, Geosci. Model Dev., 6, 563–582, doi:10.5194/gmd-6-563-2013, 2013. Haëfliger, V., E. Martin, A. Boone, S. Ricci, S. Biancamaria, 2017: Assimilation of virtual SWOT water levels in a regional hydrometeorological model. (under preparation for submission in 2017). IPCC, 2014: Climate Change Synthesis Report. Contribution of Working Groups I, II and III to the Fifth Assessment Report of the Intergovernmental Panel on Climate Change [Core Writing Team, R.K. Pachauri and L.A. Meyer (eds.)]. IPCC, Geneva, Switzerland, 151 pp. Le Moigne, Patrick and co-authors, 2013: Evaluation of the lake model FLake over a coastal lagoon during the THAUMEX field campaign. Tellus A., 65, doi:http://dx.doi.org/10.3402/tellusa.v65i0.20951. Masson, V., P. Le Moigne, E. Martin, S. Faroux, A. Alias, R. Alkama, S. Belamari, A. Barbu, A. Boone, F. Bouyssel, P. Brousseau, E. Brun, J.-C. Calvet, D. Carrer, B. Decharme, C. Delire, S. Donier, R. El Khatib, K. Essaouini2, A.-L. Gibelin, H. Giordani, F. Habets, M. Jidane, G. Kerdraon, E. Kourzeneva, S. Lafont, C. Lebeaupin, A. Lemonsu, J.-F. Mahfouf, P. Marguinaud, M. Moktari, S. Morin, G. Pigeon, R. Salgado, Y. Seity, F. Taillefer, G. Tanguy, P. Tulet, B. Vincendon, V. Vionnet and A. Voldoire, 2013: The SURFEXv7.2 externalized platform for the simulation of Earth surface variables and fluxes. Geosci. Model Dev., 6, 929-960, doi:10.5194/gmd-6-929-2013. Mironov D.V., 2008: Parameterization of lakes in numerical weather prediction. Description of a lake model. COSMO Technical Report 11, Deutscher Wetterdienst, Offenbach am Main, Germany, 41 pp. Noilhan, J. and J.-F. Mahfouf, 1996: The ISBA land surface parameterisation scheme. Global Planet. Change, 13, 145–159. Oki, T., and Y. C. Sud, 1998: Design of Total Runoff Integrating Pathways (TRIP) - A Global River Channel Network, Earth Interact., 2(1), 1–35. Paris, A., de Paiva, R. D., J. S. da Silva, D. Moreira, S. Calmant, P.-A. Garambois, W. Collischonn, M.-P. Bonnet, and F. Seyler, 2016: Stage-discharge rating curves based on satellite altimetry and modeled discharge in the amazon basin. Wat. Res. Res., 52, 3787–3814. Pedinotti, V., A. Boone, S. Ricci, S. Biancamaria and N. Mognard, 2014: Assimilation of satellite data to optimize large scale hydrological model parameters : A case study for the SWOT mission. Hydrol. and Earth Sys. Sci., 18, 4485-4507. doi:10.5194/hess-18-4485-20.